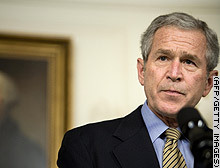 WASHINGTON (CNN) -- President Bush slammed Democrats on Friday after the House narrowly approved a supplemental war spending bill that includes an August 31, 2008, deadline for combat troops to leave Iraq. "Today, a narrow majority in the House of Representatives abdicated its responsibility by passing a war spending bill that has no chance of becoming law, and brings us no closer to getting our troops the resources they need," Bush said about an hour after the vote. The House voted 218-212 to approve the $124 billion spending bill that includes the deadline. He repeated his promise to veto the legislation if it reaches his desk. The measure appears unlikely to pass the Senate with the deadline intact. Bush said a spending bill must become law by April 15 to avoid causing hardships for military personnel. Two House Republicans -- Reps. Walter Jones of North Carolina and Wayne Gilchrest of Maryland -- voted in favor of the bill. Fourteen Democrats voted against it. After the bill's passage, House Speaker Nancy Pelosi, D-California, told reporters that voters' voices "have been heard." "Congress has acted on the concerns of the American people," she said. Before the vote, Pelosi said the bill would address the problems in Iraq by "rebuilding our military, honoring our promises to our veterans, holding the Iraqi government accountable and enabling us to bring our troops home." "The American people have lost faith in the president's conduct of this war," she added. "The American people see the reality of this war -- the president does not." "We all want our troops to come home -- when the job is done," said Rep. Sam Johnson, R-Texas. "We want to win. Internationally announcing our timelines for withdrawal literally hands the enemy our war plan," Johnson said. "What world superpower would do such a thing?" Republicans also denounced the unrelated appropriations attached to the bill. The leadership had to win over anti-war Democrats who felt that the measure didn't go far enough. But some of the war's most liberal critics said they weren't buying it. "Four years ago, we were told we had no alternative but to go to war. Now we're told we have no alternative but to continue to war for another year or two," Rep. Dennis Kucinich, D-Ohio, said before the vote. "The fact of the matter is we do have alternatives." Kucinich said, "Congress has the power to stop funding the war. That's what we should do. That's what we should have done, and that's what I'm going to continue to work toward. We have to get out of Iraq, period." However, Rep. James McGovern, an anti-war Democrat from Massachusetts who had been on the fence, said he would vote yes. Last week, Senate Democrats fell short, on a 50-48 vote, in another attempt to impose a timeline for withdrawal from Iraq. Once both the House and Senate versions are approved, a conference committee will hammer out the differences. Meanwhile, Defense Secretary Robert Gates called for Congress to pass a bill quickly, or the military would be forced to take severe stopgap measures because of a lack of funding. Among those measures, Gates said, would be slowing deployment of replacement troops in Iraq and Afghanistan and extending the tours of units already there. "This kind of disruption to key programs will have a genuinely adverse effect on the readiness of the Army and the quality of life for soldiers and their families," Gates said. "I urge the Congress to pass the supplemental as soon as possible." CNN's Andrea Koppel contributed to this report. President Bush denounces House Democrats who pushed through a spending bill that includes a deadline to pull out of Iraq.